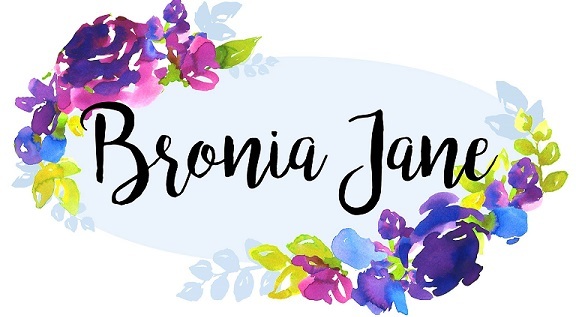 There’s no better feeling than trying a new makeup item that makes you wonder how you could possibly have been managing day-to-day without it. I’ve had this experience a lot over the last year because I’ve been gradually updating my makeup bag since graduating university. I’ve worn makeup since I was about 12 because I used to have really bad skin. It started with just foundation in the days where I used to pile dream matte mousse on my face and then it progressed to eyeliner and eyebrows and the rest was history. I also used to rely on makeup a lot because I was very self-conscious and I wouldn't even want to go along the street to the corner shop if I was bare faced. When I went to university I moved into student accommodation with nine other housemates. At first I was really worried about people I didn’t know seeing me with no makeup on but then, luckily for me, on my third day there we had an unexpected fire alarm which woke me up so I had to go outside bare faced and with completely frizzy hair. One of my housemates actually told me later that he thought I was a new housemate he hadn’t met yet because I looked so different to the person he had met days before. So yeah, that did wonders for my confidence! But in reality, going to university and living with my friends and seeing them at all hours of the day at my best and my worst was the best thing for my confidence. No one seemed disgusted by my bare face so I started relying on it less. As an extension of this, because my friends at uni weren't really into makeup like my friends at home had been, I stopped experimenting and having as much fun with it as well. For three years I basically just wore the same makeup every single day and repurchased the same stuff over and over again. Since moving home and having a job, I’ve rediscovered a love for makeup and I've been trying out new products and brands and my makeup bag has never looked better. And here’s where Urban Decay’s setting sprays come into it. A few months ago I decided to purchase a setting spray because so often I’d find myself blotting my face throughout the day or on a night out because my face would be shiny. I have oily skin so I’m always looking out for new products that will actually stay on my face and a lot of setting sprays promise big results. I feel like setting sprays are one of those things that some people see as a gimmick. I’d seen them around for ages before I actually bought one and I was very sceptical when I first used it. However, now that I’ve tried it, I really can’t see myself going back. I can see a definite difference between the days I use it, where I don't have to touch up my makeup all day, compared to the days I forget and find myself blotting my face in the bathroom at lunchtime. I have two of Urban Decay's setting sprays, De-Slick which is specifically for people with oily skin and All Nighter which promises to help your makeup stay on all night. Although I see positive differences in my makeup whichever spray I use, for me De-Slick is by far the better product. 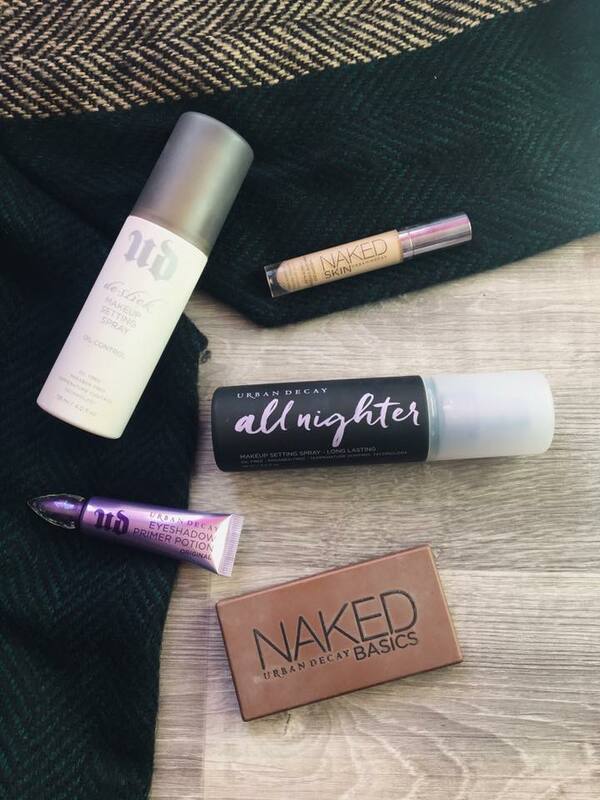 I tend to use De-Slick for my everyday makeup and All Nighter for if I’m going out in the evening but when my current bottle of All Nighter runs out, I’ll probably just switch to using De-Slick all the time. This isn’t to say that All Nighter won’t work better for other people, just that De-Slick produces the best results for my skin type. 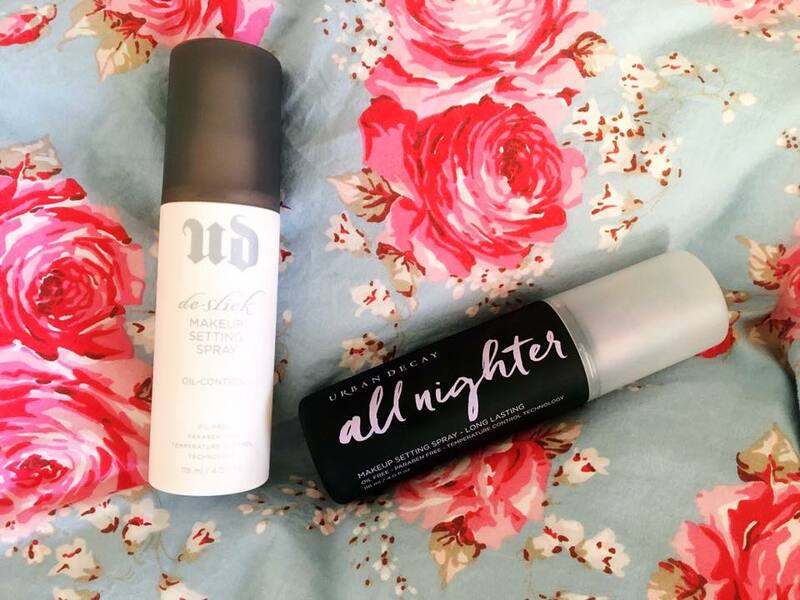 As you can see from the photos, the De-Slick bottle I have is the old Urban Decay design whereas the All Nighter bottle is the new one. All Nighter photographs a lot better than De-Slick because the old packaging is so light. One good thing about the packaging change is that the old white bottles get dirty really quickly, especially because you’re often reaching for them with other products still on your hands whereas the new bottles have a really clean design. So far I’ve only tried Urban Decay’s setting sprays but I’d love to try out sprays from other brands to see how they compare. Do you use a setting spray? What do you think?